Every time Rebel goes out into the yard he always brings the bone with him. He is forever chewing them up ! He can't seem to get enough of them! 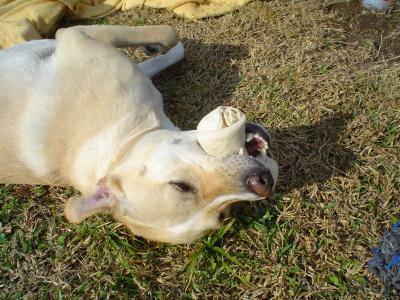 This particular time he was just rolling over and over with the bone in his mouth, enjoying it very much. How funny this is...what a ham!